﻿ ▷ Where does the name New York come from? Read the story! Where does the name "New York" come from? New York is one of the largest cities in the United States. It has a population of approximately 30 million people most of who live in its metropolitan area. It regarded as the financial capital of the United States because it is the home to Wall Street, United Nations headquarters and the World Trade Centre. But where does the name New York come from? Manhattan Island is the oldest part of New York City and still retains its old Lenape American name. Although the natives Canarsees and Lenape had lived here for many years, New York was explored by the Europeans in the 1500s. 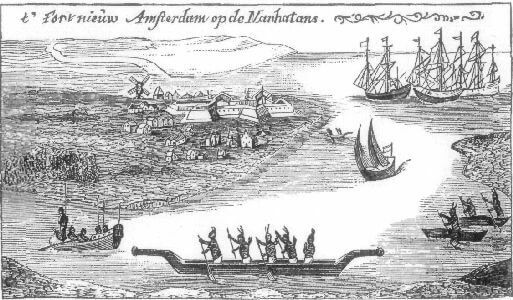 Europeans from the Netherlands settled in the city of New York in 1624. The Dutch named the entire New York area "Nieuw Nederland" (meaning New Netherlands) and later named the town that was on the southern side of Manhattan as “Nieuw Amsterdam” (New Amsterdam), named after the capital city of Netherlands to become the current New York City. The English started to colonise New York in 1664 during the Anglo-Dutch war. They later changed the name to New York in honour of Duke of York who became King James of England. By the time the English started to colonise New York, other towns could become New York including Harlem, Brooklyn and Flushing. New York later continued to grow to become what is now the financial capital of the most powerful nation under the sun, the United States of America. New York is also known as the Empire State because of its vast resources and wealth. This nickname appeared on the license plates between 1951 to 2001. But no historian can tell clearly where the nickname originated. It is also known as the Excelsior state which means the city is ever upward. People and businesses who reside in New York are sometimes called the New Yorkers.